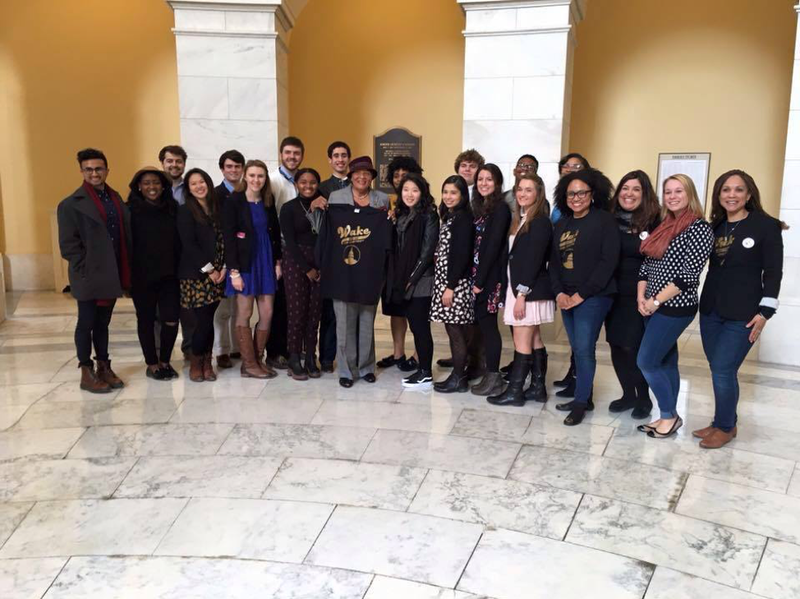 Last week, a smaller group of Wake the Voters travelled up to Washington, DC for a shorter 30 hour excursion. This trip definitely brought back memories of the past summer when I spent the summer living in Rosslyn (Arlington), VA interning on Capitol Hill for Representative Jim Langevin (RI-02) and exploring the city in my down time. Though the trip was short, it brought out memories of DC and made me realize how much I missed the city. We started out the day with a tour of the White House. Despite spending nearly 80 days in DC last summer, the White House was the one place I wanted to go, that I couldn’t get to go. And it was just as magnificent as I expected. The walls in the entrance way were lined with pictures of racially significant moments of President Obama (including the iconic picture of President Obama and Representative John Lewis on the Edmund Pettus Bridge). While I recognized a lot of these pictures from following the president closely on social media, it was amazing to see these pictures in person. As some of us were walking down a hallway with some pictures and portraits of retired presidents, we heard somebody say that the Obama dogs had wandered out onto the White House lawn. Those who know me well, know that I am a huge dog lover (I swear, I was a dog in a previous life). And I had jokingly told a friend that morning that I would do anything to meet (and get a selfie with) the presidential dogs. Unfortunately Bo and Sunny did not get close enough for me to pet them, I still got a couple good pictures and gained another great memory. Anything is possible. After our tour of the White House, we went over to the EEOC and got to meet with some of the behind the scenes policy makers. While I have always been more interested in policy making through the legislative branch and through think tanks, it was worthwhile to hear how these policy makers got their starts in politics. If Senator Sanders or Secretary Clinton is elected president in November, I could definitely imagine myself heading over to the EEOC for a few years (for some reason, I don’t think that Senator Rubio or Mr. Trump would be interested in hearing my opinion on policy matters). Anything is possible. After a meeting with Representative Adams, I actually had the opportunity to go speak to Representative John Lewis, the Civil Rights leader, which was unforgettable. I actually had the opportunity to meet Rep. Lewis this past summer while I was interning, but I only got to spend a couple minutes with him (and the picture I got was awful haha!). Representative Lewis has always had a special spot in his heart for young people interested in politics, and most interns have stories of running into Rep. Lewis and having him take a couple minutes to talk to him. This time I got to sit down in his office, and had the opportunity to hear some of his stories about fighting on the front lines for Civil Rights. I got to give him proper thanks for his fight (and victory) for Civil Rights. I will always remember the few minutes I spent in his office, the stories he told, and pictures he showed. Plus Representative Lewis is the king of the selfie (even in his 80’s!) Anything is possible! Finishing off the day, we had a delicious dinner at Matchbox. And yes, I finally found my toasted coconut donuts. And they were well worth the weight (but maybe not the Calories haha!) Anything is possible!